The pod of ~85 pilot whales that beached themselves repeatedly between 14-18 January 2014 were injured by excessive pressure changes (seaquakes) above the epicenter of 3 quakes that erupted in the seafloor of the Southern Ocean about 5,000 km upstream from Farewell Spit on 22 December 2013 (see links above). Strong winds caused rough seas, which separated the pod in Golden Bay. Twelve whales went ashore with the shoreward flow of the incoming tide on the morning of 14 January. That night, as the tide started washing out to sea, the rescuers refloated the whales and guided them back into waist deep water and let them go. They swam a few kilometers away, but when the tide started rising and the surface currents began flowing back to the beach, the whales turned and came back to restrand. They were again guided out on the falling tide on the night of the 15th but again they came back when the tidal currents started washing back to the beach. They eventually died or were shot. The remaining 73 whales went ashore with the incoming tide in the early morning of 18 January (video). They were also pushed back from the beach on a falling tide, but they too came back when the tide started washing back to the beach. Again, they were pushed back into a falling tide and again came back when the tide started to rise. Watch the above video. If you look close at the water, you can tell that the wind and currents are flowing shoreward. You can also see the shoreward direction of the wind by looking at the blowing hair and clothes of the rescuers. 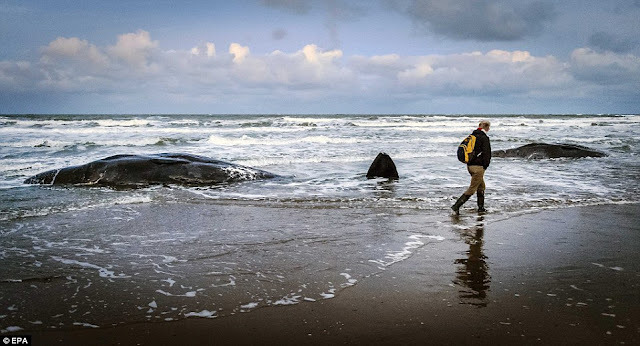 You will see a man wearing a hat while pushing a whale out to deeper water. He says, "At the moment, they want to go back to the beach. They're pretty determined to go there," he adds pointing to the beach with his thumb. He also says, "It's a bit of a hand full to keep them going the right way." The opposite is also true. If the wind and current were flowing out to sea, the whales would readily move off the beach and out into deep water. Obviously... these whales are not navigating... they are as lost as a blind man set adrift in a row boat. In the open sea, whales always beach at the high tide line. If the whales strand in a backwater lagoon, the tide and water flows from under them and they don't beach... they just get stuck in the mud. It is equally true that when the tide falls, the already stranded whales are left high and dry many meters from waist-deep water. This means that refloating most beached and mud-trapped whales is only possible during high tide. However, the most important factor in getting the lost whales to swim away from the shore is overlooked by the rescuers who should have noticed by now that there is always a change in surface currents between a tidal outflow and a tidal inflow. Why can't the rescuers realize that the whales are swimming back and forth in the tidal and wind generated currents? So-called successful rescues occur only when the rescuers move the whales with the flow. Many times when the shoreward wind is strong, the rescuers truck the whales to a different beach where the wind is blowing out to sea. Let's assume that the 3 seaquakes did injure this pod. What is the nature of this injury and why did the whales swim ~5,000 km from the Southern Ocean to Farewell Spit only to beach themselves? The seafloor is greatly disturbed during extremely shallow undersea earthquakes, especially along mid-ocean ridges. The jerking motion in the rocky bottom acts like a giant piston, pushing and pulling at the water column. The dancing seafloor generates a series of hydroacoustic pressure changes called seaquakes. Another way to say the same thing is that the seafloor becomes like the faceplate of a gigantic sonar transducer. The intensity and frequency of the pressure changes depend on the frequency and speed at which the seafloor dances, not the magnitude of the quake. It's the speed of the dancing that generates the most potent seismic pressure changes. The depth of the earthquake's focal point is also critical... the closer the focus is to the seafloor, the more violent is the movement in the seafloor causing extremely whale-dangerous pressure changes in the water. It should not shock you to learn that pods of whales are sometimes injured by earthquakes as low as magnitude 4.5 since many of these lessor events are focused no more than 2-3 kms deep in the seabed. There is also solid scientific evidence indicating that quakes focused less than the length on their seismic waves traverse the rock/water interface with no loss of energy. This means that the P-waves enter the water column as if the rock/water interface was non-existent. Of course, when the more powerful S-waves slams into the rock/water interface, the seafloor is greatly disturbed. The effect is a double whammy; one from the P-wave and one from the S-wave. Shallow earthquakes are extremely dangerous to diving whales; however, the circumference of the danger zone is determined by the depth of focus; the closer the focus to the rock/water interface, the smaller is the danger zone. The problem is sorting dangerous events from harmless ones is that, in the data, the depth of focus is defaulted to 10 kms in oceanic regions. One 4.5 M quake might be harmless while another 4.5 M quake is deadly. Mariners have called these pressure waves seaquakes since the 1500s; this energy is known scientifically as T-Phase waves. T-Phases sometimes catch the diving whales by surprise. The injury is pressure-related (barotrauma) and centered around the many enclosed pockets of air in their heads. Pilot whales first evolved 50 million years ago from 4-legged mammals similar to large wolves. Before they became aquatic, they had cranial sinuses similar to humans. As air sinuses, these enclosed spaces were of little value underwater; however, this all changed when toothed whales began to evolve a biosonar system. Since there is a strong impedance mismatch between air and water, when underwater, these enclosed pockets of air will reflect sound waves like light bouncing off a mirror. It's only naturally that air sinuses in the heads of many whales evolved into underwater acoustical reflectors (acoustic mirrors) to bounce sounds around in a fashion to improve underwater listening. Over 10-20 million more years, the air chambers took on the job of reflecting, funneling, and channeling returning echonavigation signals in a fashion to make navigating the ocean with sound waves possible. The problem is that carrying a head full of acoustic mirrors (air sinuses and air sacs) down with you on a deep dive is dangerous because the air is easily compressed/decompressed by the increase/decrease in the water pressure surrounding each whale. When air is compressed underwater, the volume is greatly reduced. When air is decompressed, the volume expands. Toothed whales must constantly balance the air volume in their sinuses as they descend and ascend. This balancing process is easy if the changes in ambient pressure are relatively slow. On the other hand, a series of rapid and excessive pressure changes, similar to what the pod might encounter while diving and feeding above the epicenter of an undersea earthquake, could cause an expansion/deflation type injury in their sinus membranes, or in the nearby tissue. As evolution progressed, the function of their echolocation and echonavigation system (biosonar) became totally dependant on the acoustic mirrors contained in their cranial air sinuses and air sacs. If these whales suffer a pressure-related injury (barotrauma) while diving, they will retuned to the surface and find that their acoustic navigation system no longer works. That's not all... they will also discover that the barotrauma in and around their cranial air spaces prevents them from diving and feeding themselves. Not able to dive, feed, or to navigate, the lost pod begins to swim away from the epicenter in a random direction. The flowing surface currents quickly adjust their swim path and points them downstream. In this fashion, the surface flow chooses the stranding beach. The winds control the surface flow so they might just as easily been carried to different beaches if the winds are blowing differently. The reason there is a seasonal stranding pattern at Farewell Spit is because there is a season wind pattern. Big nasty oceanic sharks are attracted to the injured pod. They sense the whales are in trouble and move in behind them to pick off any stragglers. Fear of being eaten alive causes the whales to stay close to their pod mates and keeps them swimming along at a good pace. The sharks show respect to a tightly grouped pod because the whales can still defend themselves. That they stay in a close pod is a selfish act to prevent shark attack. They may look to humans like they are closely bonded and act as a pod, but the truth is that they are practicing self preservation by staying close to each other. The closer each individual is to the center of the pod, the less chance it will be eaten alive by vicious sharks. They sometimes appear to be following a leader but in truth what we see is nothing more than the blind following the blind in hopes the lead whale knows where he is going. Being pushed along by the sharks, the pod can easily cover up to 250 km per 24-hour day and would have arrived at Golden Bay at about the time of the strandings. Local currents take over near the beach. Notice in the videos of various strandings how the tide is rising and the water is usually washing into the sand during the beachings. Ask yourself... where else would a non-navigating whale end up other than the beach when the currents are flowing ashore. After all, the current is the same energy that carried each grain of sand to the beach in the first place. This is not rocket science... it is very dumb of the rescuers not to see that the whales are always swimming with the flow of the currents. Beached whales NEVER swim for more than ~50 meters against the flow. An expert olympic swimmer could NEVER swim upstream wearing a blindfold because water is 800 times denser than air. The force of the water when swimming against the flow is ten times greater than swimming downstream. This force (resistance) will turn any lost swimmer, and point them headfirst in the direction of the flow. If the swimmer just floats along, they will still be carried downstream. EVERYTHING IN AN OCEAN CURRENT WITHOUT A SENSE OF DIRECTION ALWAYS GOES DOWNSTREAM. You might also wonder, since their sinuses evolved such an important acoustic function, why didn't evolution protect them from an injury caused by seaquakes? Evolution run into an impasse trying to help whales dive deep to feed on squid and still protect them from the occasional dangerous seaquake. The problem was that the sinus membranes could not be made thicker or tougher and still function as acoustic mirrors for high-frequency echolocation clicks. In other words, making the sinuses stronger to withstand seaquakes down-tuned their acoustic function. There was another more-important problem evolution had to solve. Pelagic (offshore) toothed whales and dolphins were very successful a few hundred years ago; they multiplied like buffalo on the American Plains. The real danger for the species as a whole was overgrazing on the squid. Allowing a seaquake to thin the pods from a particular feeding grounds was the best way to prevent overgrazing and the destruction of the squid breeding stock. Evolution made the best choice. By allowing quakes to injure a few pods every year, the number of whales along the mid-ocean ridge feeding grounds were kept down to a manageable level. Evolution decided instead to work on ways to help the pods recover from seaquake injuries. The object was that after a pod's biosonar system was knocked out, the whales would group together for protection against sharks and swim downstream for a few thousand km and then recover from their injuries and find a new feeding grounds. This was evolutionary friendly because it spread the species all around the globe. Besides sharks, the biggest danger an injured pod would face on their way to finding a new habitat was dehydration and enough nourishment to keep their strength up and their immune systems functioning to prevent pneumonia. But finding nourishment and fresh water was not a major issue 150 years ago because the oceans were teeming with massive schools of surface fish. All the seaquake-injured pods had to do was swim down a few feet and open their big mouth and eat as much small fish as they could catch. The massive schools of surface fish gave the whales what they needed to maintain their immunity and to swim along for 4-5 weeks while their sinuses healed. Because their biosonar was knocked out during their journey downstream, they had no idea how to get back upstream to their previous feeding grounds. The had to find a new home, which was good because it spread the species and protected the squid breeding stocks along the mid-ocean ridges. Then along came modern man. His large fleets of purse seining factory ships depleted the schools of surface fish the whales relied on for recovery. Pods are not recovering like they did 150 years ago. Strandings are increasing and the pod count is dropping fast. They swim blindly into whichever beach the current carries them. They are dehydrated, and have no fresh food in their stomachs. They catch all kinds of infections. Their normal burden of parasitic worms doubles due to immune failure. They can not survive without fresh water and nourishment; however, rescuers keep pushing that back out to sea claiming they have saved the poor stranded whales. At least the rescuers are doing some good; they are feeding the starving sharks. Scientists don't know anything about barotrauma in the cranial air spaces of whales because there is "no available scientific information" on the topic. The reason might be legal. Scientific information revealing barotrauma will trip a dozen or so "best available scientific information" clauses contained in the various marine mammal protection acts model after the US laws enacted in 1972. These clauses say that our governments must protect whales according to the "best available scientific information." Barotrauma is a major concern for all divers, man included. But there is no scientific information about such an injury in whales in any science journals. If scientific information becomes available showing that barotraumatic injuries occur, then the Marine Mammal Protection Act will kick in and our governments will need to enforce rules that protect whales from barotrauma. However, since there is "no available scientific information" on barotrauma and barosinusitis, then such injuries do not exists and can not be considered when drafting Environmental Impact Statements covering the use of military sonar, oil industry air guns, and explosives. Let me know what you think. Make a comment. This is very interesting as a large 6.3 magnitude earthquake has struck today just north east of the stranding site. The whales we refloated earlier in the day. One assumes they will strand again. The 6.3 event was thrusting and would be dangerous to whales, but it was epicenter on land 28km below the surface. I see no evidence that events deeper than 10-15 km injure whales, especially epicenter on land. Still, big quakes near shore can generate potent pressure disturbances in the water. The pressure oscillations are called T-Phase waves. There's lots of research on T-Phases. One event 3 km inland on South Island generated hydroacoustic T-Phases that traveled 1,800 km below the surface of the Tasman Sea and shook Australia so hard that it alarmed people near the beach.